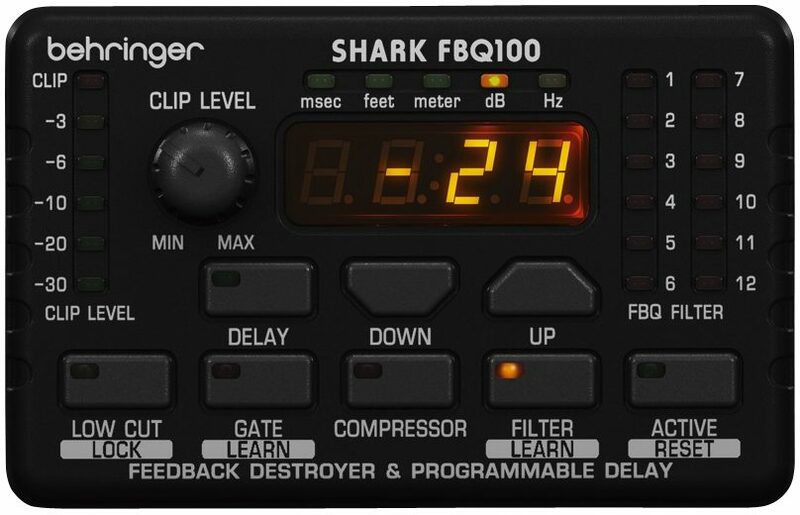 Destroy feedback right at the source with the Behringer FBQ100 Shark a great DI box that has integrated mic pre, line delay, noise gate and compressor. Looking for feedback control? Maybe you need a compression or noise gate? Or a great DI box for line-level instruments? Whether you use it with microphones, acoustic instruments, or as a delay line for large venue loudspeaker systems, the Behringer FBQ100 is a "must-have" for your live and studio toolkit. Thanks to its intelligent "Learn Mode," the FBQ100 can automatically equalize your PA and protect your sound system from feedback. Behringer's search algorithm ensures feedback frequencies are attenuated within a fraction of a second, using narrow 1/60 octave single-shot filters. The remaining filters automatically take action as required, adjusting only the specific frequencies causing the feedback, so your music stays powerful and alive. Delay lines are required to compensate for time variations resulting from speaker positioning in large venues. 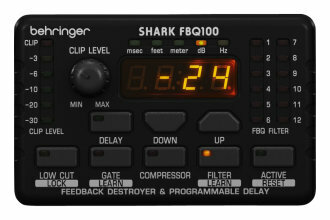 The Behringer FBQ100's delay can be adjusted in meters, feet or milliseconds. The maximum delay time of 2.5 seconds corresponds to a distance of 850 meters. Combining several FBQ100s with the optional rack-mount kit puts a complete professional loudspeaker management system at your fingertips.